Look forward to events that can be used as goal dates. For example, the Pacific Northwest Writer’s Conference is in July this year. What would happen if I had my book ready and published in order to market at that event? The idea excites me! It feels good. Can I realistically meet this goal? With hard work and focus, I think it’s doable. Now, I work backwards from this date and plan accordingly. I love making collages or dream boards. They feed my secret inner artist (let’s just say this side of me should remain a secret—when I draw stick people, others ask me what they are). Cut out images and words from magazines. Find pictures online. Write down favorite quotes or poems. Make bold statements or promises to yourself. Wax poetical about how awesome you are! Another type of visual aid I enjoy is to create a gigantic wall calendar for my poetry goals. I did this a couple years ago and it inspired me to create work that ended up winning some contests and getting published. As the month goes on, I’ll add more stickers and doodles so by the end of the month it will be its own art. My poetry goal for this year is to submit to at least five literary journals and/or contests per month and to write one to two new poems per week. 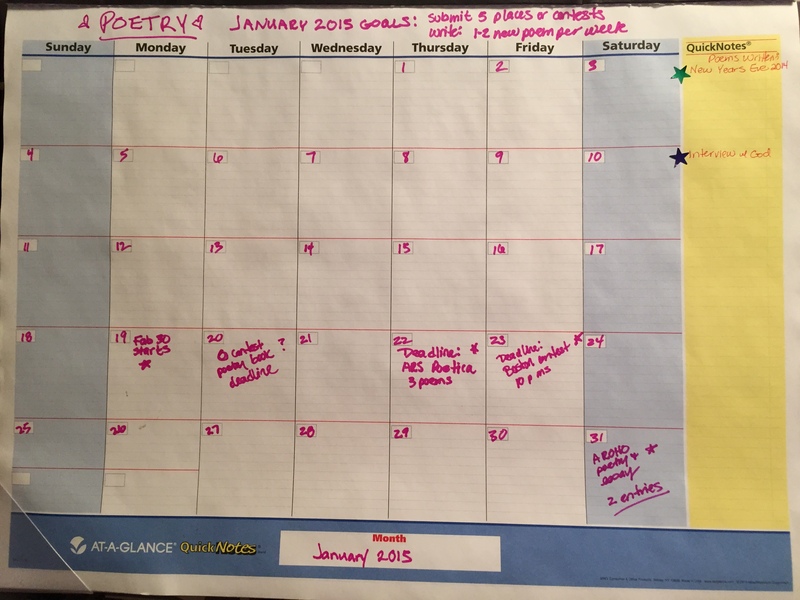 I track all this on my giant calendar and give myself stars or hearts or other colorful stickers when I submit or finish a new poem. Note: When I did this a couple years ago, I met my submission goals by July and I was out of poems to submit. This year, I’ve added the extra goal of writing one to two poems per week so I can continue creating new material and submitting. We learn from our previous goals! Tip # 4: Celebrate your small achievements!!! Celebrate your small achievements! I can’t stress this enough. Success begets success. Every time you accomplish a small goal, take a moment or longer, and really congratulate yourself, celebrate yourself and honor yourself. You are wonderful. Incredible. Awesome! Read Carly’s post to learn more about adopting tiny habits to ensure your success. Great post! It’s reminded me how important it is not only to have goals but to write them down somewhere that’s visible to keep them in mind. Best of luck with your goals for 2015! Thanks, Fiona. Good luck to you, too!